Draken is swedish for Dragon or kite. 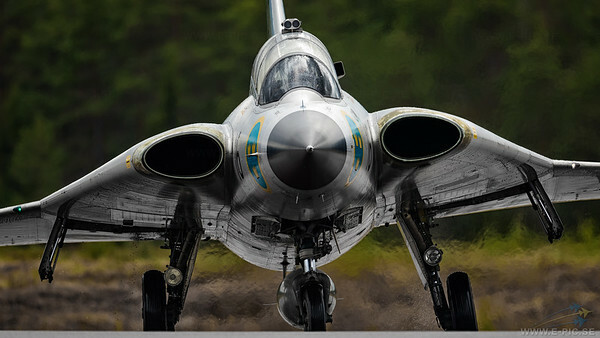 As the jet era started, Sweden foresaw the need for a jet fighter that could intercept bombers at high altitude and also successfully engage fighters. Although the J 35 Draken was not designed to be a dog-fighter, it proved to have a good quick-turn capability and was a capable fighter plane. It first flew in 1955 and was retired from opreational service by the last operator Austria in 2005. 50 years after its first flight! Demanding requirements of the design were the capability to operate from reinforced public roads used as part of wartime airbases, and for refuelling/rearming to be carried out in no more than ten minutes, by conscripts with minimal training. It entered service with the Swedish Air Force in 1960. A total of 651 Saab Drakens were manufactured. Sweden's fleet of Drakens came in six different versions, and two other models of the Draken were offered for export. The early models were intended purely for air defense. The last model built was the J 35F. The J 35 Draken design underwent several upgrades. The last was the J 35J version, made in the late 1980s, although by then, the Draken had been almost replaced by the Saab 37 Viggen in the Swedish Air Force. The J 35J was a service-life extension program because the delivery of the new Saab JAS 39 Gripen was suffering delays. The extension program was intended to keep the Draken flying into the 2000s, but due to cutbacks and high maintenance costs, the Draken was phased out of Swedish service in December 1998, although the aircraft remained in limited numbers in both military and civilian roles. Its export customers included Denmark and Finland. In 1985, the Austrian Air Force purchased 24 J 35Ds reconditioned by Saab, re-designated the J 35Ö.